Otis Dooda and his family are moving from a dinky little town called Hog’s Head to an apartment on the 35th floor in New York City. Otis is excited about the move, unlike his older brother Gunther, but things don’t start so well... The first morning Otis is cursed by the potted plant in the lobby. Not too worried about the curse, Otis goes about exploring his new domain and meeting the neighbours including Boris, Cat and Perry with his farting pony - although he insists it is just a large dog as keeping ponies in the apartment building is not allowed. But it turns out his new friends are worried about the curse, all curses uttered by Potted Plant Guy come true and they don’t have much time. It is almost the full moon. Unless Otis wants all his bones broken they must find a way to break the curse. Unfortunately, every attempt Otis and his new friends make just seems to make the situation worse. It looks like the Dooda family’s first week in Tidwell Towers is going to be memorable. 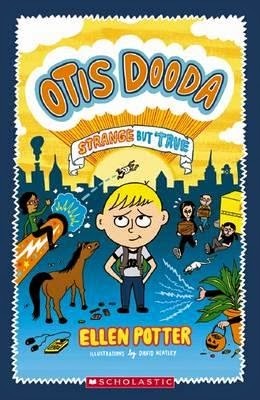 Otis Dooda Strange but True is a fun story. Otis is immensely likeable and Tidwell Towers is full of wacky and wonderful characters. It is really easy to get caught up in their adventures, which are funny, quite ridiculous, but not too far-fetched. It leaves you with a ‘that could happen’ feeling. Enticing chapter headings such as How I know that my Brother is a Doofus, Poodles of Mass Destruction and Why I Slept in a Box make the book hard to put down and the funny illustrations on every page enrich the story. Large clear type and short chapters make it perfect for primary aged children. Hopefully there is a sequel planned. Readers will be eager for more adventures with Otis and his friends.